Machine learning is an application of artificial intelligence that provides systems the ability to automatically learn and improve from experience without being explicitly programmed. The image above shows how a machine can learn to play a musical instrument provided the correct training. This article covers some of the basic concepts, functions, and algorithms to help beginners get started with machine learning. So, let’s start our journey by building a simple classification project. We have to train our algorithm in such way that it could classify any new examples into one of the 3 species. You can have a look on the dataset provided in the Iris_flower.txt file. I hope you got the idea of what are we going to build. Secondly you must have a basic understanding of the matrices, and Octave commands and few algorithms. With this said let’s dive into the fun stuff….Yeah! the code. You can see there are 4 features(already mentioned above)for each training example separated by commas and the name for the respective species of the flower. Here, we have used the names for the flowers but in practise we are going to replace it with numbers 1, 2, and 3 respectively. This file is like the skeleton for our project because it contains all the function calling statements. Let’s look at the file and try to understand the full code from the scratch. % the bias term in theta. The graph for the sigmoid function(‘g’) or the logistic function is shown above. No matter what the input is the function outputs a value between 0 and 1. We have implemented this cost fuction in our lrCostFunction.m. Let’s see what does it do. 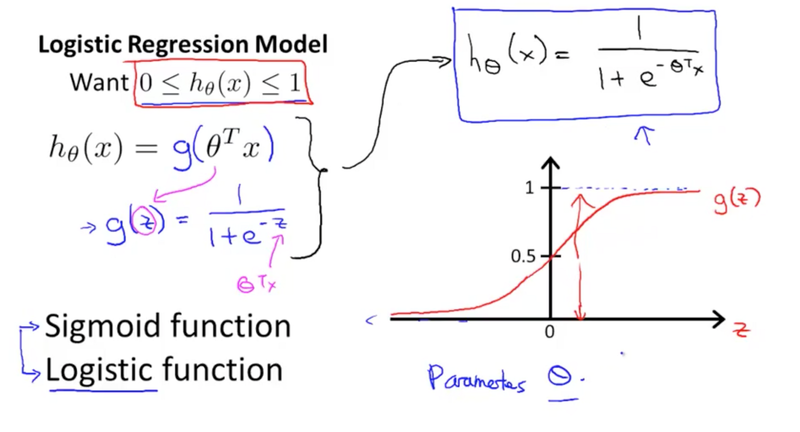 We have used regularization in the cost function as well as in the gradient. If you remember the concept of regularization we don’t regularize the bias term(theta0) both in the cost function and the gradient. Now, let’s take a deeper look at the code. We first calculate the hypothesis(‘h’) and use it to futhur calculate J which is our cost function. To remove the bias term from the regularization we substract the square of the bias term from the sum of the square of all theta values. Then we calculate the gradient(all theta values are simultaneously calculated) and to remove the bias term from regularization we update the value of grad(1) as shown above. It calculates the sigmoid of the argument(matrix or vector) which results into a value between 0 and 1. This algorithm divides the given set of data to us(here 3 sets)into 2 sets of data and tries to find the perfect fit or our hypothesis function or more precisely the parameters theta needed to fit the 2 sets of data created. It does this for all the different sets(all different species of flowers). So, for the given training set we would have 3 different hypothesis function which we store in our ‘all_theta’ matrix. With that said let’s look at the oneVsAll code to see how it works. Now, let’s look at some of the details of this function. The arguments for the oneVsAll function are X(150×5), y(150×1), num_of_classes(3), and lambda. We have made ‘all_theta’ matrix to store our best fit theta values that the function ‘fmincg’ is going to return. Inside the loop, first we have the initial_theta which acts as our starting point in order to minimize J(taken as a zero vector). You can think of it as coordinates which are set to zero with the end goal to reach the perfect fit coordinates. Then we have our options object that we pass into our advance optimization as an argument. Options object sets ‘GradObj’ as ‘on’ which means we want to consider gradient to minimize our cost function followed by ‘MaxIter’ which tells us the number of iterations we want to perform to minimize our cost function. Next, we pass our cost function with arguments initial_theta(as ‘t’), X, (y == i), and lambda into fmincg which minimizes our cost function. Minimizing the cost function returns an optimum theta(best fit values for theta) which we store into our all_theta matrix. In this function we pass our all_theta matrix and X matrix to predict the type of species for all the training examples. Let’s look at the code for the function and discuss some important concepts. We define a prediction vector ‘p’ of the size of our X vector to store our predicted value for all the training examples. To perform this task we calculate the hypothesis vector that returns a hypothesis value for each of the classes(each of the 3 species). The maximum predicted value among the three values would be taken as the prediction. The max function returns the maximum value(max_val) as well as the index for the max_value. We need the index value because we need to predict either of the three values 1,2 or 3. Our ‘p’ vector would thus contain 150 predictions and which we use to calculate the accuracy. The accuracy vector contains the fraction of the correct answers predicted which comes to be around 97%. This means our algorithm performs 97% accurately. This is an advance optimization which is used to minimize a function according to the given arguments. You don’t really need to know this code right now and it’s quite advance for you to understand as a beginner so just focus on its working. i = i + (length<0); % count epochs?! i = i + (length>0); % count iterations?! z2 = (sqrt(B*B-A*d2*z3*z3)-B)/A; % numerical error possible - ok! M = M - 1; i = i + (length<0); % count epochs?! z2 = -d2*z3*z3/(B+sqrt(B*B-A*d2*z3*z3)); % num. error possible - ok! if ~isreal(z2) || isnan(z2) || isinf(z2) || z2 < 0 % num prob or wrong sign? elseif (limit > -0.5) && (z2+z1 > limit) % extraplation beyond max? elseif (limit > -0.5) && (z2 < (limit-z1)*(1.0-INT)) % too close to limit? This function returns the best fit theta parameters into our [theta] matrix in the ‘oneVsAll.m’ function used above. You can alternatively use ‘fminunc’ function which does the same job as ‘fmincg’ but is used when there are fewer features in the training examples. This code hardly takes time to be completed once you know the concepts behind the algorithms. I hope you enjoyed doing this project, if you did, feel free to click the ‘clap’ button.